The idea was to do an early checkout dive at 9AM on New Year’s Day, followed by another more challenging dive (or two) before noon, by which point we would have to stop to allow enough decompression time before flying home the next day. Post New Year celebration drowsiness prevailed, however, and we were only able to do the one checkout dive before it came time to stop. The Club Noah checkout dive is meant to be an easy, shallow dive along a reef and wall right off the front of the resort. I suited up in the clubhouse and strolled out to the pier to put on my BC and regulator (borrowed from my younger brother Raymond, as my old gear had been cannibalized to provide parts for other gear sets). Right from the pier, one can simply dip into the water from the steps and, already surrounded by curious fish, fin out towards the reef and wall. Surface swell was considerable, still causing motion as deep as 15 feet, but below that the wave motion lessened — and visibility dropped somewhat due to some type of plankton in the water. 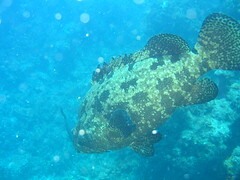 As for local marine fauna, fishes of various size abounded, from tiny needlefish to giant groupers. In a small valley between reef walls, a kneeling statue of an angel at prayer had been set up as an artificial attraction, as yet untouched by coral growth. 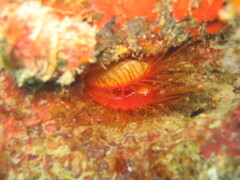 Especially fascinating was an electric scallop embedded under a coral overhang, bright blue flashes of pigment along the lips of its mouth simulating tiny bolts of lightning. Even more exciting later on in the dive was an encounter with a moderate-sized pawikan, or sea turtle, serenely rooting through sand in the shallows before swimming off as divers crowded around it. 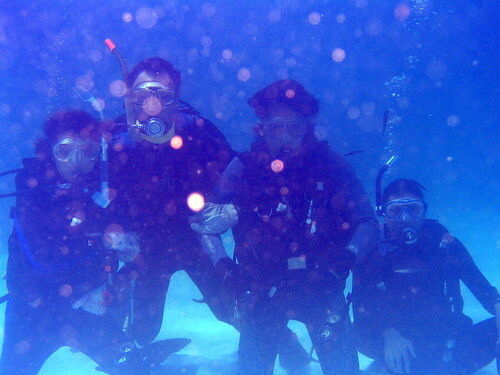 A fairly good dive, all in all, my only regret being we could do no more dives — not without risking decompression sickness on the flight back to Manila the next day.